All of our ROVs have an open frame which allows for a significant amount of real estate when expanding the versatility of the system with additional tooling and scanning options. The fibre optic tether is also designed to offer additional communication channels so that the same tooling and scanning options are easily adaptable to new or existing ROV system. Typical fibre optic umbilical contains four power wires, two twisted pair for telemetry and sonar, and four multi‐mode fibre optic strands. 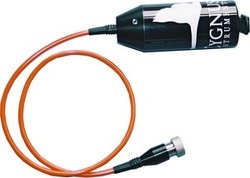 8‐pin Impulse connector for sonar. Given the power, communication and mounting requirements and the connector specifications, it is possible for an ROV wiring harness and electronics canister to be customized to suit your specific working environment or tooling needs. Some common options are outline below. This is not a comprehensive list so please contact us directly on integration details and pricing or if you have a specific inquiry.